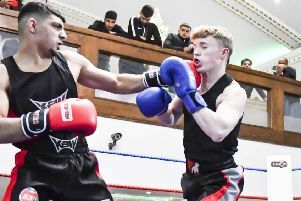 Ismail Dawood in action during Saturday's top-of-the-table clash between Hanging Heaton and Pudsey St Lawrence. Cleckheaton slipped to third-bottom in the Bradford Premier League after they suffered a 45-run defeat to Lightcliffe last Saturday. Cleckheaton spinner Qaisar Ashraf was in terrific form to take 6-48 but it was opening batsman Kasir Maroof who played the decisive innings of the match for Lightcliffe. Maroof smashed 106 out of Lightcliffe’s 181 all out, which included two sixes and 13 fours. Alex Stead claimed 5-26 in reply as Cleckheaton were reduced to 89-8 before Sam Wilson (25no) and Andrew Deegan (22) offered late resistance but they were eventually bowled out for 136. Farsley bounced back from defeat to Woodlands with a 75-run win over Townville and they closed the gap on leaders Hanging Heaton to six points. Dan Hodgson made a superb 105, hitting three sixes and 14 fours along the way, and was ably supported by Ryan Cooper (46), James Wainman (35) and Greg Pickles (35) as Farsley posted 287-7. Conor Harvey was pick of the Townville bowlers with 3-68. Opener Jonathan Booth led the way with 61 in reply in an innings that included six fours. Clark chipped in with 41 and Nick Bresnan made 34 but Townville were bowled out for 221 as Farsley spinner Adam Ahmed (4-64) and Mark Harrison (3-64) sealed their team’s win. Defeat sees Townville drop to fifth in the table, 23 points off the top.